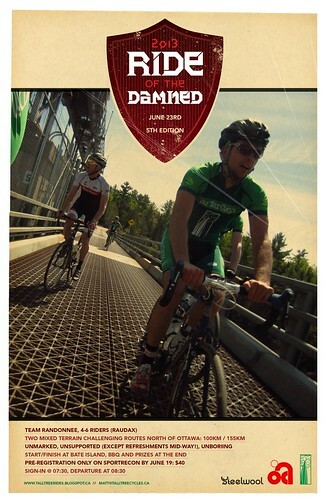 Tall Tree Cycles Ride Log: Ride of the Damned Registration is Live! Ride of the Damned Registration is Live! We're rolling, folks! One team is in already! Sign up now and spread the word for lots of FB likes! Lets get 'trending,' #rideofthedamned !!! The first 25 entries will receive free tire advice from the Bike Angel, Rodd Heino! The next 25 will receive hearty high-fives from Dave Stachon! Matt, your @talltreecycles.ca account doesn't seem to accept messages: I registered for this ride, and want to send you a message about being sorted to a group. My email is back up and running, sorry about that! Message sent to Heather. We'v launched the new blog! Raffle Tickets are Available to All! Mississippi Mills Grand Prix: Plan, Execute, Win? Ride of the Damned: Its Alive!